arts, originally uploaded by jahansell. Another friendly neighborhood business in Sharon. I can't vouch for the quality of car care, as I usually go to a shop that's walking distance from my office. But I like Art's sign! Art's sign is artsy! 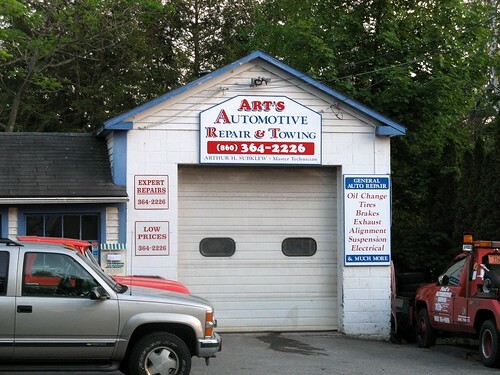 The place looks so neat and clean for a car repair business. Nice! That is a good sign...I wonder is the owners name really Art/Arthur or has he just used that for its acronym value. Art's ART...and that is art! And it is tiny! How can Art work in there? Maybe it's a time-travel machine & inside it has the dimension of a palace...Sweet though, more attractive than Midas, but possibly not as fast & eefective.